I LOVE this top! I have worn it three times already. I love the little bit of plaid on the front and that it looks like 2 shirts in the back. 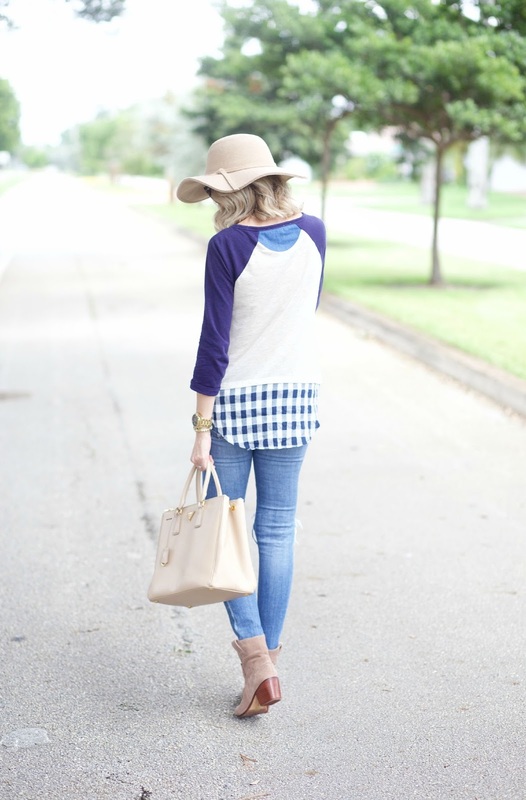 It is a great way to wear plaid even though it isn't cool outside yet. At least not in Florida. I have really been on a big Anthropologie kick lately. they have some really great Fall pieces. I know I wear these jeans and these boots all of the time. They are staples in my closet. The hole on these jeans has gotten so big from wearing them so much. Andi thinks it is funny to pull all of the strings and the hole just keeps getting bigger and bigger. Fantastic casual outfit! These ripped jeans fit you perfectly! beautiful bag!!! so elegant and stylish! Gorgeous! Love it! This is adorable! I love all of your Anthro finds lately! Love this casual look, Jade! You've had so many great Anthro finds lately!! Love these pieces on you! You look ready for Fall!! The hat makes the look so chic! You look awesome! LOVE the boots!!! Sadly it's still in the 90s here, so no boots yet. Really cute outfit. I love this top too! And I'm just like you, I wear my favorite clothes 500 times as well! I love that shirt. It was delivered today and I am excited to get it! Thanks! Her sparky look is just awesome. I like your all post. You have done really good work. I like play game: Zombie Tsunami | zombie tsunami game|zombie tsunami apk|game zombie tsunami|zombie tsunami app |unblocked games | Score Hero download |Score Hero app | Score Hero cheats | Diep.io |Diepio | Diep io | retrica app | retrica apk. What about you? The awesome weather in summer for fun.